Cantaloupe certainly isn't the first fruit you think of when it comes time to make jam, but that doesn't mean it shouldn't be on your "must can" list! This Salted Cantaloupe Jam is a new favorite in our house. 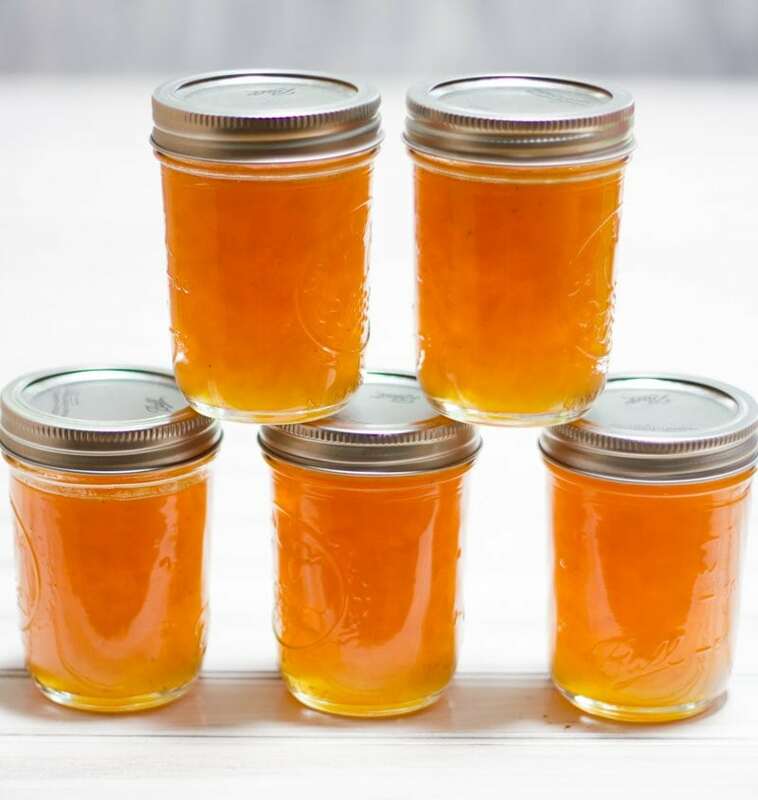 Cantaloupe certainly isn’t the first fruit you think of when it comes time to make jam, but that doesn’t mean it shouldn’t be on your “must can” list! This Salted Cantaloupe Jam is a new favorite in our house. I take a lot of pride in where I live. I know a lot of folks consider Indiana a “fly over state” and that might be a negative to the vast majority of citizens in this country, but I’ll let you in on a little bit of a secret—us Midwesterners enjoy the fact that we’re off the radar. I love that I have neighbors who never will bother me unless I need them to, and then they’d give me the shirts off their backs. I love that I can drive for hours and hours and see little more than farmhouses and cornfields. I love that I can keep my car unlocked (and running) while I pop into the post office. And I love that I can drive up to any one of two dozen farm stands within a five mile radius in August and buy farm fresh cantaloupe by dropping a few quarters in an old coffee can. Southern Indiana isn’t really well-known for a lot of stuff (other than being Louisville’s hat), but one thing we do excel at is making some seriously mean cantaloupes. In particular, Jackson County, Indiana—which is just north of where we live—is pretty well-known in the region as having the best cantaloupes in all of the Midwest. Folks drive hundreds of miles to visit this rural Indiana county just to grab a cantaloupe or two! I’m not sure what it is about this area that produces the sweetest, juiciest, biggest cantaloupes you’ll ever see, but I’m not complaining. We only planted a handful of cantaloupe plants this year, but we have no less than 473,000 melons on the vines right now (not only are cantaloupes grown in this area incredibly delicious, but they’re also incredibly prolific). And as much as I love eating cantaloupe morning, noon, and night, the truth is, we’re a little bit overwhelmed with our haul. Melons are one of those summer items that can be really difficult to preserve for winter eating, but I figured it might be worth a shot to try turning some of our bounty into some cantaloupe jam to enjoy during those cold January nights. And, man, was that ever a good idea. 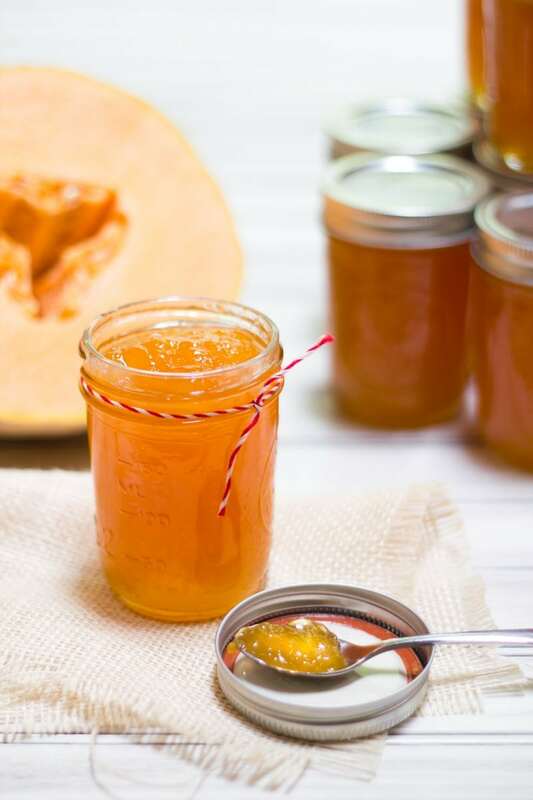 The idea for salting the preserves came from the fact that summer dinners for me growing up meant a giant bowl of cantaloupe on the kitchen table for dessert. And next to that bowl was always the salt shaker. Just like all sweet foods, a little bit of salt sprinkled on some fresh cantaloupe slices really sets it off. I figured those flavors would be really interesting combined into a jam. 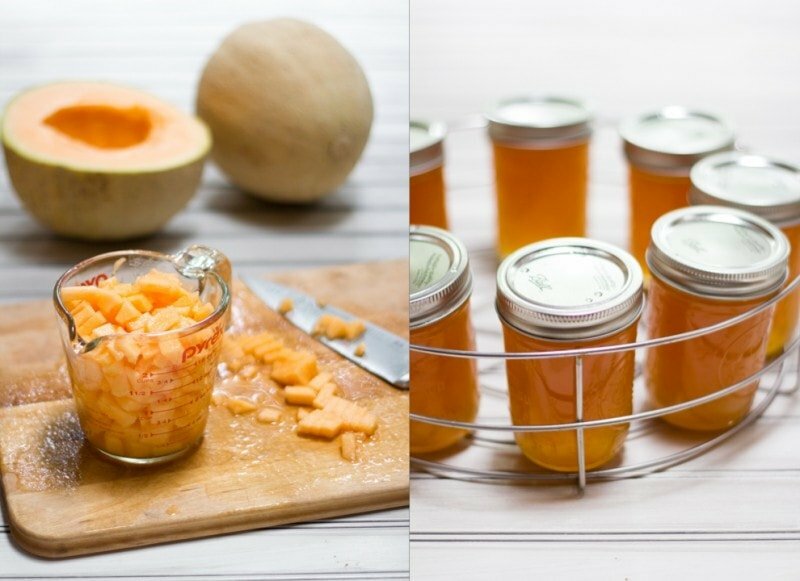 Because of the welcoming of our little girl, I haven’t had the chance to do as much canning this summer as I normally like to, but I was so happy I carved out an afternoon to make this cantaloupe jam. Not only is it delicious, but there is something about canning that makes me feel incredibly connected to my roots. My parents canned food. My grandparents canned food. My great-great-grandparents canned food. My soul tells me I should be canning on a weekend afternoon in August. It’s hard to explain, but there is something about ladling bubbly jam into steaming hot jars that makes me feel a little more connected to my past. To me, canning is so much more than just stocking away some food (although, that’s a nice perk, too). Because of this love of canning, I am so happy to be participating in Ball Canning’s International Can-It-Forward Day for my third year. I’m excited anytime I get a chance to spread the love of food preserving! I’m so proud to work with an incredible Indiana company like Jarden Home Brands (makers of Ball and Kerr Mason jars). Can-It-Forward Day is this upcoming Saturday, and they will be live streaming seminars and canning demonstrations on their website to help folks get excited about canning. If you’ve ever wanted to get started canning but were too afraid or intimidated, this Saturday is a great way to get your feet wet! Now, go make some cantaloupe jam! Enjoy. Fill a waterbath canner with water, and place inside eight half-pint jars (make sure the water covers the jars). Bring to a boil. Place lids and rings in a small saucepan with hot water and heat, but do not boil. Bring cantaloupe, lemon juice, and 3 1/2 cups of sugar to a boil in a large stock pot over medium-high heat. Bring to a full, rolling boil that cannot be stirred down (it should take 10-15 minutes). Once the mixture is at a full boil, whisk together the remaining sugar and the pectin. Whisk the mixture into the cantaloupe mixture. Bring mixture back to a full boil, and then boil hard for 2-3 minutes, or until the mixture looks thickened and is set. I like to test it by putting a small amount on a spoon and placing it in the freezer for a few minutes. If it’s jelly-like when it’s cold, it’s set! If not, boil for a few more minutes. Once set, remove from heat, and stir in the vanilla extract and salt. Remove the hot jars from the waterbath canner, and turn the canner back up onto high. Ladle the jam into the hot jars, leaving a 1/2″ headspace. Using a clean, damp cloth, wipe any extra jam from the rim of the jars, and then place on the lids and the rings—tightening just until snug, not overly tight. Place the jars in a rack in the waterbath canner, bring to a boil, and process for 10 minutes. Remove from canner, and let cool completely. Check seals after 24 hours—the lids shouldn’t flex or move when pushed down on. Store sealed jars in a cool dark place for up to a year. Any jars that don’t seal, place in the fridge and eat within a month. I’ve never made my own jam before, but I LOVE cantaloupe. This would be so tasty on pancakes, toast, or stirred into yogurt. Yum! I’d love to can some salsa! It’s my favorite condiment! That looks so good! I have never canned anything but I would love to start! I’ve never canned before but have always been interested in it. I would love to learn how to make mango pepper jam. I want to learn to can anything and everything! I’ve done sliced jalapenos, corn relish and a freezer jam. I’ve never canned before (but I do remember “helping” my mom with it – aka eating jam – when I was little in Norway), but I have a friend who is ready and willing to show me the ropes once I get my own gear, so this would be perfect! I have never even thought of cantaloupe jam!! Now, I need to try some. I would have never thought to make something like cantaloupe jam. I would love to try this! I’ve always wanted to figure out how to make dill pickles! i’m OBSESSED with canteloupe and would probably adore that jam! I would love to can fruits, lemons, and possibly tomatoes! Research CAREFULLY when you can tomatoes if you don’t do it right and can at the correct temp it can end in illness we LOVE doing our own but I know my grandma always made sure to be real careful that they sealed correctly and everything was clean! I make tons of salsas and canned tomatoes most years, but I always pressure can them. I would love to start with strawberry jam! I’ve never canned before, but would love to try tomatoes or strawberry jam. I want to get into canning this summer since my freezer has no more room for garden goods. I love having a bit of summer in the middle of winter. Just called my husband at the store to bring home 2 cantaloupe! I really want to learn how to can dill pickles. I got a bag of Mrs. Wages spices but it says to use a non-reactive pan and I have no idea how to tell what my pans are made of. I also don’t have any materials for water bath canning, but I’d love to learn. My family has always canned but I’m a little afraid to do it on my own. I also want to do peaches and applesauce. I tried canning for the first time this season with rhubarb jam. 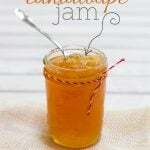 Love the idea of cantaloupe jam! As a recent master’s graduate taking the summer off, I have been canning all season as a way to stretch my grocery budget and my growing season. My favorite are fridge pickles, made with something sweet and a couple hot peppers from the garden. Fridge pickles are my favorite because they keep their crunch. i have never done any canning but i have several friends who do can tomatoes and lots of fruit! my sister in law has made grape jelly !what about cherry or greem bean canned? I just made a whole lot of cherry jam. I never thought of jamming cantaloupe! I will have to try this! What a great idea! I will keep this in mind if I ever have a lot of cantaloupe! I desperately want to can a corn salsa, and tomato sauces. I do jam, pickles, etc, but I’ve never tried anything else! Just started canning last year, and I am the only one in my house who really eats cantaloupe. This recipes looks interesting. Cantaloupe and watermelon were two foods I was trying to figure out how to can. Thanks for helping with one! My family always canned things growing up, too, and I would really like to start on my own! I planted a ton of tomato plants this year and have too-many-to-count green babies just waiting to turn red to harvest! I would love to can these in lots of forms (sauce, whole, crushed, salsa, etc) to have on hand for the winter! I would like to learn how to do picked cauliflower. Pickles! The only ones I’ve made were a soggy nasty mess that became chicken food in a hurry! I have to be honest and say that while I would use some of the jars for canning, probably 80% of them would be used in my classroom to hold supplies. I’m always looking for glass jars! I love canning! It’s one of my favorite hobbies. This year I’ve been experimenting more with savory jams. So good on cheese and crackers or as a glaze for meat. I tried my hand at canning pickled radishes (no-go) and apricot-lime jam (yay! ), but I want to expand my abilities and be able to can more whole tomatoes, sauces, pureed squash, etc. That jam looks delicious! 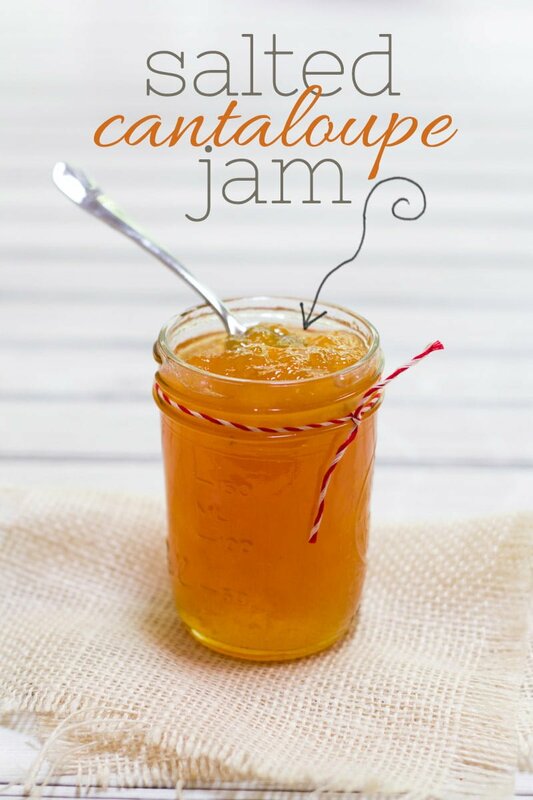 Wow, cantaloupe jam sounds incredible! Canning is something I’ve wanted to learn how to do! I’ve made freezer jam and pickled beets – next up I’d like to learn how to make hot sauce, chutney, and red pepper jelly! Love your posts about growing and preserving food! I need to learn how to can more things. I recently tried out a green tomato jam-elish (jam and relish) and it was fabulous! I want to learn to can jam and salsa. cantaloupe jam? crazy awesomeness! I can’t wait to try this! I want to learn to can meals–I can do things alone, but canning them together to make a soup would make dinner so easy! I’d love to learn to can peaches, I have fond memories of my Great Grandma’s canned peaches and slurping up the sweet, sticky syrup that the peaches came in after we devoured the fruit. Tomatoes. I feel like tomatoes I use the most often. I’d love to try my hand at jam! I would like to learn how to can tomatoes. Well, I already know how to can jams, jellies, pickles, beans, and broth. I think next, I want to make my own spaghetti sauce. I’d like to learn how to can my own jam. I would love to learn to can anything! This isn’t something that was passed down in my family and it intimidates me! 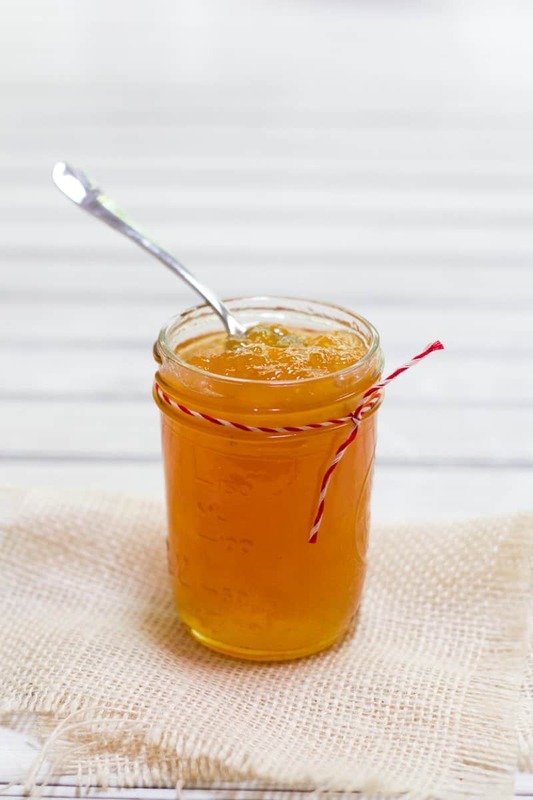 I’d like to can peach preserves for a taste of SC in the winter! This looks fantastic! I can’t wait to bring this to my next office meeting with my team. They are going to love it :-) Thanks for sharing! That looks delicious…I love using unique jam flavors on a cheese plate. I’d like to learn how to pressure can veggies and stocks as I’ve got the water bath canning pretty much down. I’d love to know how to can tomatoes! My grandma has been making her own raspberry and blackberry jams for ages now, and we always love to get a jar or two of “grandma jam” to take home in the summer. I would love to try making her recipe at home and have my own stash to last all year! I’ve been making jam but I want to do something more challenging like green beans. I would love to try and can peach jam with some of the incredible peaches I’ve been getting at a farm on my way home from work! I love canning pickles. I hope to learn to can squirrel this fall!! I haven’t actually canned much, but I would love to can salsa! I’d love to learn how to can my own fruits and veggies, especially so it’d be less expensive to buy them in the winter. 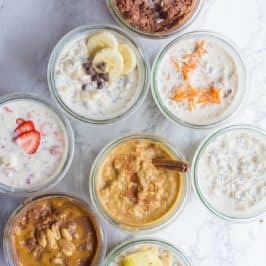 I have just started canning and would love to learn more about it. I would love to learn how to can spicy green beans! Yummy! Any way to use less sugar and have it still turn out okay? I haven’t tried it, but I don’t see why low-sugar pectin won’t work. You could probably cut back 1-2 cups. But it’ll take some experimenting to make sure it sets. Love your recipes. Would love more low sugar chutneys! I have FIVE POUNDS of tomatoes this week and I’d love to learn how to preserve them! I have no idea how to can anything. I tried to make pickles once and failed miserably. 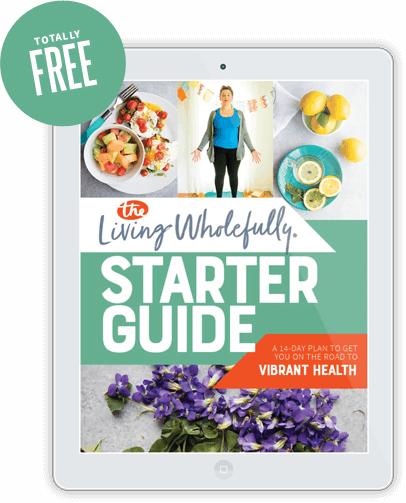 So, really – I’d like to try anything! i would never have thought about canning canteloupe jam — or making canteloupe jam — but this looks amazing! Your recipe sounds yummy! I have never tried canning, but I love cherries and I think they would make for a great jam/jelly?! I love, love, love canning strawberry jam! I have never, ever considered canning cantaloupe! But it sounds delicious. Tomatoes! I’ve never canned before so while it looks scary, it would be a fun and good thing to do! I would love to try canning pickles. I’d love to learn how to can spaghetti sauce. I grew up canning with my Mom, but we’ve always stuck to jam, etc – which I don’t eat a lot. I know there is something more complicated with spaghetti sauce, but I’ve never really understood why. I would love to learn how to can salsa. Tomatoes are so summery fresh and I would love to crack into a jar of tomato salsa in the dead of winter to get a taste of some summer! 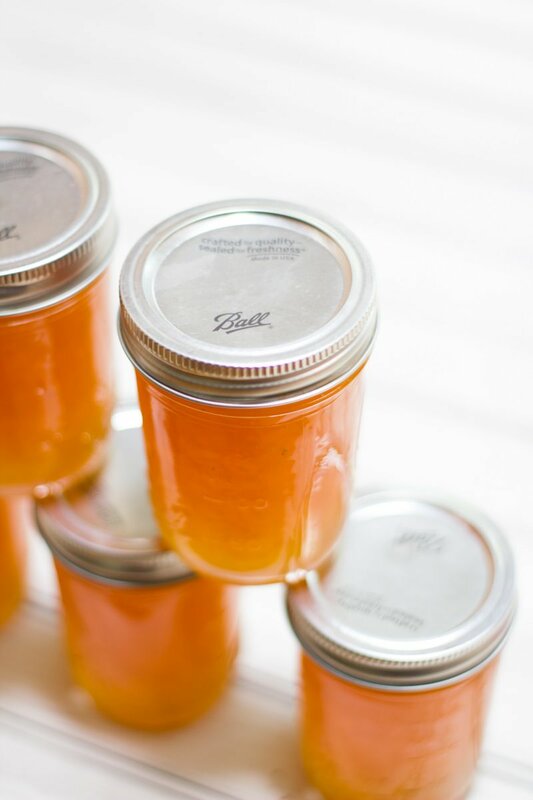 I recently canned peaches, peach butter (which totally bombed and is more like syrup…yum! ), and pickles. Hoping for applesauce, pears, and possibly salsa or tomatoes. Oh and green beans! I love canning! Huh. This is not something I would have thought of, but it looks delicious! I love to learn different ways to can asparagus. They just look so pretty in the jar! I would love to can some homemade spaghetti sauce – yum! I would love to learn how to can salsa! I would love to get more adept at making various kinds of jam and jelly. My mom has always stuck to the basic berry jam varieties, but jelly or other fruits would be fun! the salted cantaloupe sounds great – dh loves cantaloupe. i like learning new fruit jam recipes. 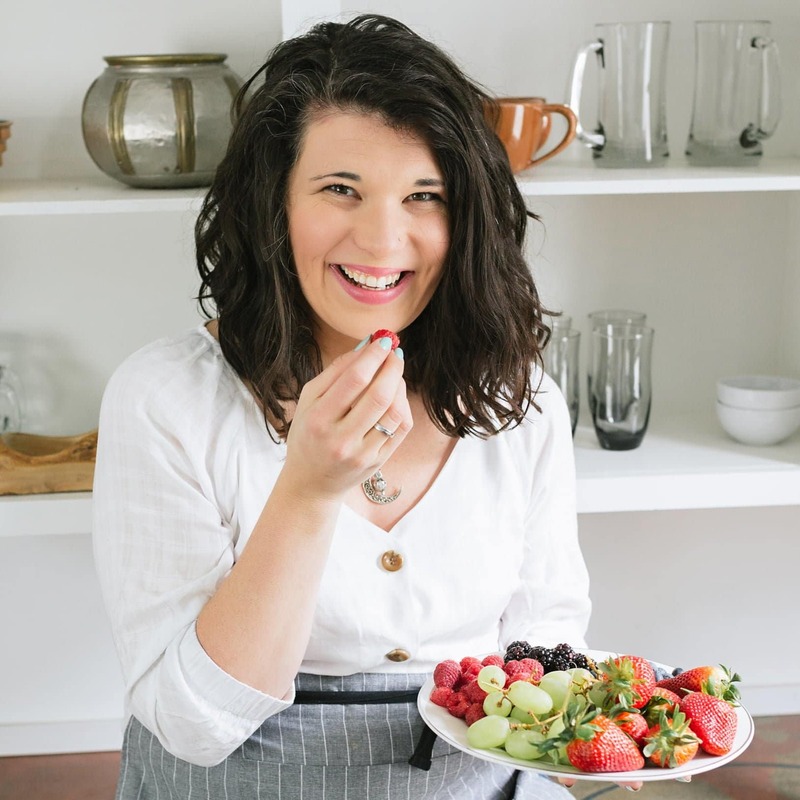 I would love to learn how to can so that I can carry on the tradition of making Grandma Jelly – it’s simple fig and strawberry gelatin jam, but it’s as much of a piece of my childhood as summer and sunshine. I would love to learn how to can pretty much anything! I’m obsessed with mason jars, and have plenty, but I’m pretty much too scared to try. I think it would be neat to can salmon, we like it and I have never pressure canned. I love cantaloupe, but had never thought to make it into jam. I would like to can the abundance of jalapeno peppers my one plant has been producing. Maybe jalapeno jelly should be on my “to can” list! I love Ball jars. Their new straw sipper lids are our favorite thing here. I have been longing to learn some canning! This is inspiring. I have always wanted to try canning spiced peaches and vegetables so I can enjoy them all year round. My mom taught me how to can, I’ve always been glad for that! I’m hoping to make some sauerkraut this summer! I would love to learn to can peaches. I just made this and it was awesome. A really unique flavor that makes you go hmmmm. And it looks so pretty with the clear-ish orange color. The one thing I would recommend would be to cut back on the sugar. It was a little too sweet for my taste. Thanks for a great recipe! I will be starting from scratch and would love to make my favorite jam, PLUM! 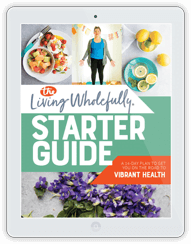 I’ve always wanted to try canning – what a great giveaway! I would love to learn how to can anything. Right now we freeze pretty much everything and con nothing My kids love applesauce so I would start with that and then jams and jellys. I want to learn how to can anything and everything! But, I should probably start with the bounty of tomatoes, zucchini, jalepenos and yellow raspberries that my garden provided this summer. 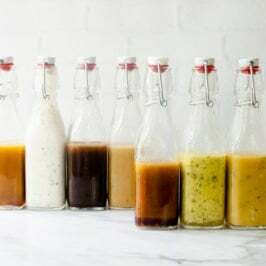 Thanks for sharing all your fabulous recipes and tips for those of us trying to preserve (pun intended) a natural lifestyle. Salted Cantaloupe Jam? Hmm… Never thought about making something like that but I definitely like the idea. 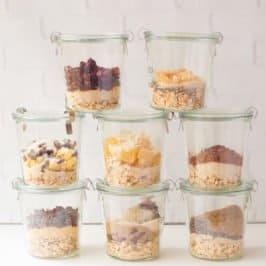 I love Mason jars for everything – storing food, drinking . . . and canning too! Just started last year with pickles and tomatoes and looking forward to trying other things! i would like to learn how to can tomatoes – our garden is exploding with them this year! I have never canned on my own, but would love to carry on a family tradition! I also have some very delicious Indiana cantaloupes! This looks amazing! I do a crabapple jelly that it’s almost time for – the Ball package would be a total bonus for me there. I would love to can tomatoes because they are coming! I would really like to can figs. I’d like to learn how to can basically everything! Any recs on a good pressure canner? We use a “vintage” one that’s been in the family for 30 years! So, sorry, I don’t have any idea about the new ones. Question – about how many cantaloupes equals 6 cups? Would love to try this, but not sure how many I need to get from the farmer’s market… thanks for the help! What size did you dice the cantaloupe to get six cups? There is a picture in the post of the diced cantaloupe in a measuring cup. Smallish, but not tiny. No need to be fussy about it. Maybe 1/2″ x 1/4″? I do quite a bit of canning but the one thing I have not gotten into doing yet is making pickles…why, I don’t know. It really ought to be next on the list! I’ve canned fruits (jams, pie fillings, etc. ), but would love to learn to can savory things like relish or tomato sauce. I would love to can some jams especially some cherry jam. I like your jam idea! If our farmers market gets some canteloupes in, I might have to try it! I’d love to learn how to can strawberries / strawberry jam. I love the homemade stuff! 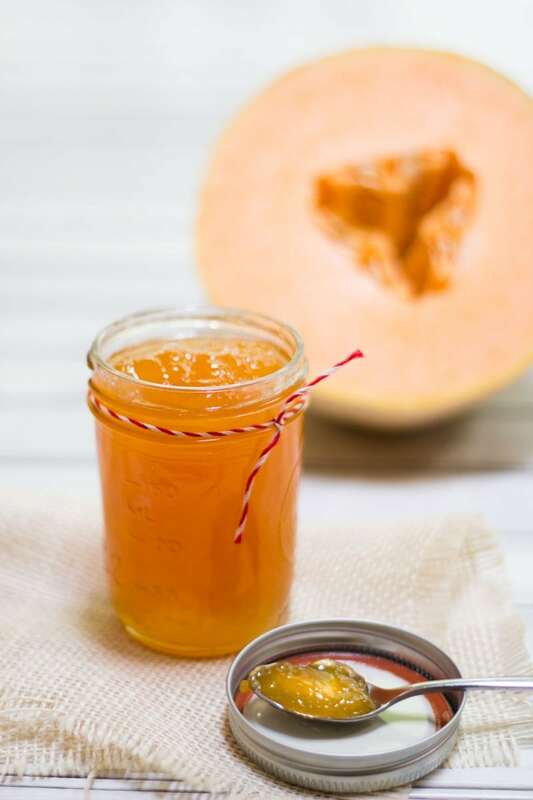 I am totally fascinated by this cantelope jam – I love summer melons and never thought to make jam from them! I have made small batches of what I call “smooth jam” before – seedless raspberry and blackberry jam, and my partner makes quick-pickled everything, but I would love to try this cantelope jam and watermelon rind pickles as well! I’d like to learn how to can corn, and possibly tomatoes. wow this looks seriously delicious. never really canned or made a jam before, but i definitely would love to can lemons! I’d like to learn to can tomatoes. I’d like to can tomatoes and jams like blueberry, strawberry, etc. I’d also like to can applesauce. I’m hoping to learn this year. i already do a lot of canning. Mainly water bath canning, but i’ve done some pressure canning too. i would love to learn to can soups and also potatoes. 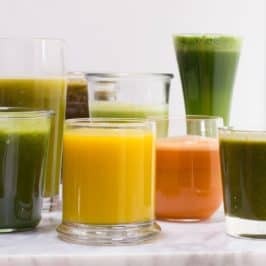 For some reason the low acid foods intimidate me a bit, so i have avoided them. I’m a beginner and would like to learn how to can black berries and peaches. I would like to learn to can jams. I’d like to can my own pickles. My daughter and husband love them! I would love to start canning, we always love receiving canned jams and veggies as gifts. I would probably start with apple butter because yum! I have canned lots of veggies (marinara, zucchini, pickles, green beans) but I have never tried jams. I would love to try jellies and jams. I would like to learn how to make and can my own sweet pepper relish, so I can stop buying it from a specialty store. I have only canned once and it was intimidating for me. I really want to try and can more things because I love the idea of growing good food and being able to eat well all year long. My boy is a freak for anything cantaloupe. Can’t wait to try! I’d like to learn how to can meat products. I’d love to learn how to can peppers and tomatoes. I would like to learn how to can zucchini and tomatoes. I am new to canning but I would love to learn. I would start with canning summer veggies like tomatoes and tomato sauces. I would most like to learn how to can stewed tomatoes and pickled asparagus. This year I hope to have enough peppers to try canning those. 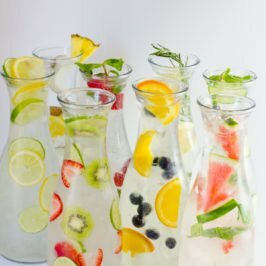 I recently found out that you can water bath can them (with the right recipe) and can’t wait to try! I would like to learn how to can fruits. I want to learn how to can meats, such as smoked salmon. I would like to learn how to can preserves. I have never canned anything before but I would love to do some jams. So far I have only been brave enough to can berries. I would love to learn to can veggies, like green beans. And I would love to learn to pickle. Thank you for the wonderful giveaway! I want to learn how to can salsa & tomatoes. I would like to can jams and jellies!! I would like to make jams & jellies but I am most interested in preserving things we put on the table every day: VEGETABLES! I would love to can strawberry preserves. I’d love to can green beans & strawberry jam. I used to watch my Grandma can those! I would love to learn how to can fresh fruits. Oh man….that salted cantaloupe jam looks delicious. I’d love to learn to can jams, meats, and veggies. tomatoes, asparagus and pickles. my daughter just gave me a couple of strange cucumbers from her garden – she’s learning to be quite a little farmer – one was a white cucumber and another a lemon cucumber. I’m sure there will be lots to can! I’ve been eating my way through some of my mom’s grape jelly. Best grape jelly that has ever existed! I’d love to learn how to can tomatoes. I would most love to learn to can blackberries. I love anything blackberry! Pickles. Sounds silly but I am afraid at this moment. Last year was my first year canning. I did ketchup and applesauce. They were simple. Pickles somehow scare me, I need to take the plunge!!!! This jam is awesome! It is delicious and esy to make. I had fresh orange peel available so I added it. Thanks so much for sharing this recipe. <3 the jam. What a lovely glowing color! I don’t see in the recipe where the salt and vanilla go in. Does it go in after you boil? Ohhhh my goodness!! This makes up the BEST jam I’ve ever made!! I’ve made it with both cantaloupe AND honeydew with great success!! Thank you SOOOOO much for sharing this recipe!!!! I made your jam for my mom, whose father was from Tell City, IN. We always salt our cantelope, too. Thank you so much for the recipe. It is great on biscuits. Can this be made with low sugar? What about the acidity levels? 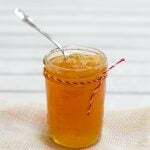 Are the two tablespoons of lemon juice enough to prevent botulism after the jam is canned? I just canned this recipe, so I’m a little nervous. That sounds like an interesting thing to try. Next summer, I’m not driving to your neighborhood, but I’ll try it with some local cantaloupes. I also don’t use sugar/pectin. I use a different pectin that jells with calcium, so it isn’t full of sugar. It’s worked with everything I’ve tried so far, so I expect it will be fine. wow, can’t wait to try it. I have made bread with cantaloupe but never heard of jam, it will be fun to give it a try this summer. I don’t know how my mom came up with her recipe. She made cantaloupe preserves 60 years ago No one had ever heard of it or guessed what they were made of. She was way ahead of her time. Miss her every day. Yes! Delicious awesomeness! Been making Cantaloupe Preserves for years out of cantaloupes that did not taste so great. Use equal parts sugar & cantaloupes and no vanilla or salt. Very excited about this Cantaloupe Jam recipe…the vanilla & Salt probably takes it up a notch! OMG!!! I just made this and it is hands down the single best testing jam I have ever made. Thanks for sharing this recipe with the world. on average how many whole cantaloupe do you think you used? I’m sure someone asked but couldn’t find it in the comments. One 3-pound cantaloupe should give you about the 6 cups you need!